Cameroon’s military says it has freed nine students and a teacher who were kidnapped this week from a school in one of the country’s restive English-speaking regions. It is the third time this month that students have been abducted from schools in the Anglophone regions. Senior divisional officer Nto’ou Ndong Chamberlin says several gunmen were killed Wednesday in the military operation, and other armed men responsible for the abduction are on the run. The teacher was wounded in the rescue. “Nine guns have been seized, four neutralized — among them the head of the team, called ‘Man of Lucks,’ and three bikes destroyed and even the camp has also been burned down by the forces of law and order [military],” Chamberlin said. Gunmen kidnapped the students and their teacher Tuesday evening from Lords Bilingual School in Kumba, a city in Cameroon’s southwest region. 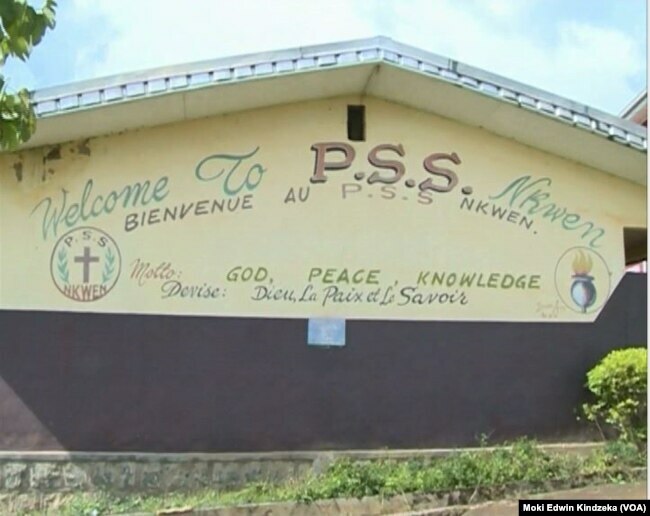 FILE – Students and their principal were kidnapped from the Presbyterian School of Science and Technology in Bafut, near Bamenda, Cameroon, Nov. 5, 2018. Pierre Marie Abbe, a political analyst at the Catholic University of Central Africa, says the government’s war against the separatists has been a failure. The government says separatists in the two English-speaking regions have torched at least a hundred schools and abducted or killed dozens of teachers. More than 90 percent of the regions’ schools remain closed. Unrest broke out in Cameroon’s western regions in 2016, when English-speaking teachers and lawyers protested the dominance of French-speakers. Cameroon’s military reacted with a crackdown, and armed separatists soon launched a campaign for independence.